The US Defense Logistics budget is estimated to be $454 million for 2012. That includes replacement parts, fuel for transporting supplies, and maintenance. The military logistics pathways spend millions of dollars shipping replacement parts across the world. 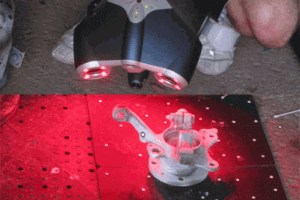 A proof-of-concept project by EADS Innovation Works recently showed they could scan and print replacement parts on site. The group scanned parts using high resolution Faro ScanArm 3D laser scanner, sent the scans through reverse engineering software Geomagic Studio, and then 3d printed the replacement parts in metal with a Arcam A2 3d printer. This workflow cuts out the normal and costly step of needing an expert to create detailed CAD models from the scans. The arcam printer prints with high enough resolution and solid materials they claim the results are as strong as standard parts. Military logistics groups could in a pinch, use the same technologies to print replacement parts and only ship the space-efficient printing material instead of packaged and palletized parts. Instead of requisitioning parts based on usage and storing extras in warehouses, the military could warehouse printing material, and print replacement parts on demand. Suppliers will probably begin inserting clauses in contracts that prohibit the military from scanning and printing replacement parts, which would cut into the profits of the suppliers. But if the military was smart in negotiating and inserted clauses now, they would be able to become a more agile fighting force. While it won’t be soon, the military of the future might be able to ship large quantities of 3d printing feed material to remote locations and print an armory, manufacturing the weapons and supplies they need on the ground as needed. With advances in precision and materials, they might be able to print drones or even vehicles. Once the technology is explored in the military, we’ll see more applications at home too, where amazon and big box stores will be able to print their products on demand, using less money on shipping costs. For a while, any savings will be reinvested in a new 3d printing infrastructure, but in the end the savings should be passed on to the customer as lower priced goods.